OVIS locking slides are absolutely perfect solutions for a myriad of storage needs. For drawers that need to stay locked in place - like keyboards, cutting boards, or mobile drawers - locking drawer slides are a necessity. The most important component of a drawer is not the drawer itself; it is the drawer slide. The right drawer slide can completely alter the drawer use experience. OVIS locking drawer slides are absolutely perfect solutions for a myriad of storage needs. For drawers that need to stay locked in place - like keyboards, cutting boards, or mobile drawers - locking drawer slides are a necessity. Sometimes conditions can force a drawer to be in awkward positions that allow gravity to force it open or closed. For example, a drawer in the back of a truck or RV will constantly be tilting in different directions. OVIS locking drawer slides prevent unnecessary tilting by literally locking the drawer in place. Having the best features for your drawers does not mean that you need to sacrifice other forms of utility. For drawers meant to store large, heavy items, OVIS provides the option of investing in heavy duty locking drawer slides that can manage hundreds of pounds without tilting, leaning, or breaking. OVIS locking drawer slides do not come in a jumble of disassembled parts. Instead, they come pre-constructed so that anybody can easily install them. For more information about OVIS drawer slide products, including their locking drawer slides, feel free to browse our website or contact us today. 12" Locking Drawer Slides, Full Extension, Zinc, 500 lb. Hettich 12" KA3338 Heavy Duty Locking Drawer Slide. Locks in both the closed and open positions. Great for mobile applications like RV's, utility truck tool boxes, fire trucks, ambulances, and other mobile applications. Telescoping precision full extension slides for high loads, up to 500 lb. capacity. Tested Weight Cap. 500 lbs. @ 10,000 cycles - 325 lbs. @ 75,000 cycles. The Fulterer FR5400.L, 14" Heavy Duty Locking Drawer Slide, can work as a lock-in only, or lock-in and lock-out drawer slide depending on the orientation of the slides. All you need to do is swap the left and right sides and the locking mechanism will operate in the other mode. 14" Locking Drawer Slides, Full Extension, Zinc, 500 lb. Hettich 14" KA3338 Heavy Duty Locking Slide. Locks in both the closed and open positions. Great for mobile applications like RV's, utility truck tool boxes, fire trucks, ambulances, and other mobile applications. Telescoping precision full extension slides for high loads, up to 500 lb. capacity. Tested Weight Cap. 360 lbs. @ 10,000 cycles - 234 lbs. @ 75,000 cycles. The Fulterer FR5400.L, 16" Heavy Duty Locking Drawer Slide, can work as a lock-in only, or lock-in and lock-out drawer slide depending on the orientation of the slides. All you need to do is swap the left and right sides and the locking mechanism will operate in the other mode. 16" Locking Drawer Slides, Full Extension, Zinc, 500 lb. Hettich 16" KA3338 Heavy Duty Locking Slide. Locks in both the closed and open positions. Great for mobile applications like RV's, utility truck tool boxes, fire trucks, ambulances, and other mobile applications. Telescoping precision full extension slides for high loads, up to 500 lb. capacity. Tested Weight Cap. 360 lbs. @ 10,000 cycles - 234 lbs. @ 75,000 cycles. Hettich KA3330 16" Heavy Duty Lock-Out Slide. Locks only in the open, extended position. This is designed for use where a slam latch or other locing system is used for the closed position. Great for mobile applications like utility truck tool boxes, fire trucks, ambulances, and other mobile applications. Please read the specification sheet for details and weight ratings. Fulterer FR5000.L, 18 inch lock out detent full extension ball bearing drawer slide. They have a dynamic weight capacity of up to 100 lbs. KCMA. These drawer slides are ideal for keyboard trays, pull-out cutting boards and any other work surface that needs to be retractable yet secure in the extended position. The Fulterer FR5400.L, 18" Heavy Duty Locking Drawer Slide, can work as a lock-in only, or lock-in and lock-out drawer slide depending on the orientation of the slides. All you need to do is swap the left and right sides and the locking mechanism will operate in the other mode. 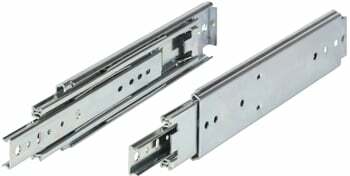 18" Locking Drawer Slides, Full Extension, Zinc, 500 lb. Hettich 18" KA3338 Heavy Duty Locking Slide.Locks in both the closed and open positions. Great for mobile applications like RV's, utility truck tool boxes, fire trucks, ambulances, and other mobile applications. Telescoping precision full extension slides for high loads, up to 500 lb. capacity. Tested Weight Cap. 360 lbs. @ 10,000 cycles - 234 lbs. @ 75,000 cycles. Hettich KA3330 18" Heavy Duty Lock-Out Slide. Locks only in the open, extended position. This is designed for use where a slam latch or other locing system is used for the closed position. Great for mobile applications like utility truck tool boxes, fire trucks, ambulances, and other mobile applications. Please read the specification sheet for details and weight ratings. Fulterer FR5000.L, 20 inch lock out detent full extension ball bearing drawer slide. These drawer slides are ideal for keyboard trays, pull-out cutting boards and any other work surface that needs to be retractable yet secure in the extended position. The Fulterer FR5400.L, 20" Heavy Duty Locking Drawer Slide, can work as a lock-in only, or lock-in and lock-out drawer slide depending on the orientation of the slides. All you need to do is swap the left and right sides and the locking mechanism will operate in the other mode. 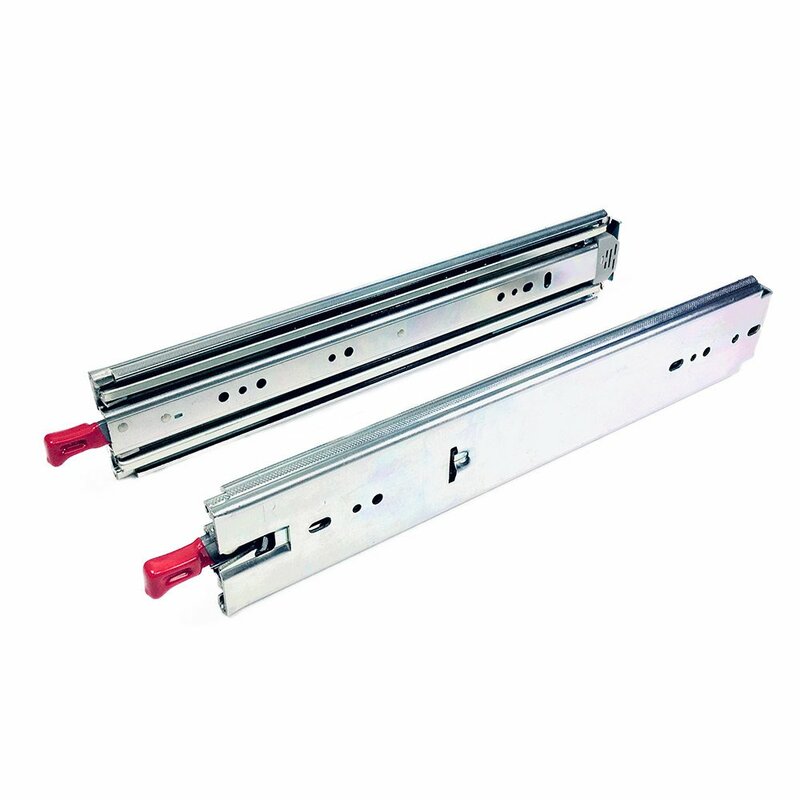 20" Locking Drawer Slides, Full Extension, Zinc, 500 lb. Hettich 20" KA3338 Heavy Duty Locking Slide.Locks in both the closed and open positions. Great for mobile applications like RV's, utility truck tool boxes, fire trucks, ambulances, and other mobile applications. Telescoping precision full extension slides for high loads, up to 500 lb. capacity. Tested Weight Cap. 360 lbs. @ 10,000 cycles - 234 lbs. @ 75,000 cycles. Hettich KA3330 20" Heavy Duty Lock-Out Slide. Locks only in the open, extended position. This is designed for use where a slam latch or other locing system is used for the closed position. Great for mobile applications like utility truck tool boxes, fire trucks, ambulances, and other mobile applications. Please read the specification sheet for details and weight ratings. Fulterer FR5000.L, 22 inch lock out detent full extension ball bearing drawer slide. These drawer slides are ideal for keyboard trays, pull-out cutting boards and any other work surface that needs to be retractable yet secure in the extended position. The Fulterer FR5400.L, 22" Heavy Duty Locking Drawer Slide, can work as a lock-in only, or lock-in and lock-out drawer slide depending on the orientation of the slides. All you need to do is swap the left and right sides and the locking mechanism will operate in the other mode. This 22" model has a dynamic weight capacity of 550 lbs. or 250 kg..
Hettich 22" KA3338 Heavy Duty Locking Slide.Locks in both the closed and open positions. Great for mobile applications like RV's, utility truck tool boxes, fire trucks, ambulances, and other mobile applications. Telescoping precision full extension slides for high loads, up to 500 lb. capacity. Tested Weight Cap. 360 lbs. @ 10,000 cycles - 234 lbs. @ 75,000 cycles. Hettich KA3330 22" Heavy Duty Lock-Out Slide. Locks only in the open, extended position. This is designed for use where a slam latch or other locing system is used for the closed position. Great for mobile applications like utility truck tool boxes, fire trucks, ambulances, and other mobile applications. Please read the specification sheet for details and weight ratings. Fulterer FR5000.L, 24 inch lock out detent full extension ball bearing drawer slide. These drawer slides are ideal for keyboard trays, pull-out cutting boards and any other work surface that needs to be retractable yet secure in the extended position. The Fulterer FR5400.L, 24" Heavy Duty Locking Drawer Slide, can work as a lock-in only, or lock-in and lock-out drawer slide depending on the orientation of the slides. All you need to do is swap the left and right sides and the locking mechanism will operate in the other mode. This 24" model has a dynamic weight capacity of 550 lbs. or 250 kg..
Hettich 24" KA3338 Heavy Duty Locking Slide.Locks in both the closed and open positions. Great for mobile applications like RV's, utility truck tool boxes, fire trucks, ambulances, and other mobile applications. Telescoping precision full extension slides for high loads, up to 500 lb. capacity.Tested Weight Cap. 360 lbs. @ 10,000 cycles - 234 lbs. @ 75,000 cycles. Hettich KA3330 24" Heavy Duty Lock-Out Slide. Locks only in the open, extended position. This is designed for use where a slam latch or other locing system is used for the closed position. Great for mobile applications like utility truck tool boxes, fire trucks, ambulances, and other mobile applications. Please read the specification sheet for details and weight ratings. The Fulterer FR5400.L, 26" Heavy Duty Locking Drawer Slide, can work as a lock-in only, or lock-in and lock-out drawer slide depending on the orientation of the slides. All you need to do is swap the left and right sides and the locking mechanism will operate in the other mode. Hettich 26" KA3338 Heavy Duty Locking Slide. Locks in both the closed and open positions. Great for mobile applications like RV's, utility truck tool boxes, fire trucks, ambulances, and other mobile applications. Telescoping precision full extension slides for high loads, up to 500 lb. capacity. Tested Weight Cap. 380 lbs. @ 10,000 cycles - 274 lbs. @ 75,000 cycles. The Fulterer FR5400.L, 28" Heavy Duty Locking Drawer Slide, can work as a lock-in only, or lock-in and lock-out drawer slide depending on the orientation of the slides. All you need to do is swap the left and right sides and the locking mechanism will operate in the other mode. This 28" model has a dynamic weight capacity of 550 lbs. or 250 kg..
Hettich 28" KA3338 Heavy Duty Locking Slide. Locks in both the closed and open positions. Great for mobile applications like RV's, utility truck tool boxes, fire trucks, ambulances, and other mobile applications. Telescoping precision full extension slides for high loads, up to 500 lb. capacity. Tested Weight Cap. 380 lbs. @ 10,000 cycles - 274 lbs. @ 75,000 cycles. Hettich KA3330 28" Heavy Duty Lock-Out Slide. Locks only in the open, extended position. This is designed for use where a slam latch or other locing system is used for the closed position. Great for mobile applications like utility truck tool boxes, fire trucks, ambulances, and other mobile applications. Please read the specification sheet for details and weight ratings. The Fulterer FR5400.L, 30" Heavy Duty Locking Drawer Slide, can work as a lock-in only, or lock-in and lock-out drawer slide depending on the orientation of the slides. All you need to do is swap the left and right sides and the locking mechanism will operate in the other mode. This 30" model has a weight capacity of 507 lbs. or 230 kg..
Hettich 30" KA3338 Heavy Duty Locking Slide.Locks in both the closed and open positions. Great for mobile applications like RV's, utility truck tool boxes, fire trucks, ambulances, and other mobile applications. Telescoping precision full extension slides for high loads, up to 500 lb. capacity. Tested Weight Cap. 380 lbs. @ 10,000 cycles - 247 lbs. @ 75,000 cycles. Hettich KA3330 30" Heavy Duty Lock-Out Slide. Locks only in the open, extended position. This is designed for use where a slam latch or other locing system is used for the closed position. Great for mobile applications like utility truck tool boxes, fire trucks, ambulances, and other mobile applications. Please read the specification sheet for details and weight ratings. The Fulterer FR5400.L, 32" Heavy Duty Locking Drawer Slide, can work as a lock-in only, or lock-in and lock-out drawer slide depending on the orientation of the slides. All you need to do is swap the left and right sides and the locking mechanism will operate in the other mode. This 32" model has a static weight capacity of 507 lbs. or 230 kg..
Hettich 32" KA3338 Heavy Duty Locking Slide.Locks in both the closed and open positions. Great for mobile applications like RV's, utility truck tool boxes, fire trucks, ambulances, and other mobile applications. Telescoping precision full extension slides for high loads, up to 500 lb. capacity. Tested Weight Cap. 360 lbs. @ 10,000 cycles - 234 lbs. @ 75,000 cycles. Hettich KA3330 32" Heavy Duty Lock-Out Slide. Locks only in the open, extended position. This is designed for use where a slam latch or other locing system is used for the closed position. Great for mobile applications like utility truck tool boxes, fire trucks, ambulances, and other mobile applications. Please read the specification sheet for details and weight ratings. The Fulterer FR5400.L, 34" Heavy Duty Locking Drawer Slide, can work as a lock-in only, or lock-in and lock-out drawer slide depending on the orientation of the slides. All you need to do is swap the left and right sides and the locking mechanism will operate in the other mode. This 34" model has a static weight capacity of 507 lbs. or 230 kg..
Hettich KA3330 Heavy Duty Lock-Out Slide. Locks only in the open, extended position. This is designed for use where a slam latch or other locing system is used for the closed position. Great for mobile applications like utility truck tool boxes, fire trucks, ambulances, and other mobile applications. Please read the specification sheet for details and weight ratings. The Fulterer FR5400.L, 36" Heavy Duty Locking Drawer Slide, can work as a lock-in only, or lock-in and lock-out drawer slide depending on the orientation of the slides. All you need to do is swap the left and right sides and the locking mechanism will operate in the other mode. This 36" model has a static weight capacity of 507 lbs. or 230 kg. Hettich KA3338 Heavy Duty Locking Slide.Locks in both the closed and open positions. Great for mobile applications like RV's, utility truck tool boxes, fire trucks, ambulances, and other mobile applications. Telescoping precision full extension slides for high loads, up to 500 lb. capacity. Tested Weight Cap. 348 lbs. @ 10,000 cycles - 226 lbs. @ 75,000 cycles. The Fulterer FR5400.L, 38" Heavy Duty Locking Drawer Slide, can work as a lock-in only, or lock-in and lock-out drawer slide depending on the orientation of the slides. All you need to do is swap the left and right sides and the locking mechanism will operate in the other mode. This 38" model has a static weight capacity of 507 lbs. or 230 kg.. The Fulterer FR5400.L, 40" Heavy Duty Locking Drawer Slide, can work as a lock-in only, or lock-in and lock-out drawer slide depending on the orientation of the slides. All you need to do is swap the left and right sides and the locking mechanism will operate in the other mode. This 40" model has a static weight capacity of 507 lbs. or 230 kg.. The Fulterer FR5400.L, 44" Heavy Duty Locking Drawer Slide, can work as a lock-in only, or lock-in and lock-out drawer slide depending on the orientation of the slides. All you need to do is swap the left and right sides and the locking mechanism will operate in the other mode. This 44" model has a static weight capacity of 440 lbs. or 200 kg.. The Fulterer FR5400.L, 46" Heavy Duty Locking Drawer Slide, can work as a lock-in only, or lock-in and lock-out drawer slide depending on the orientation of the slides. All you need to do is swap the left and right sides and the locking mechanism will operate in the other mode. This 46" model has a static weight capacity of 440 lbs. or 200 kg.. The Fulterer FR5400.L, 48" Heavy Duty Locking Drawer Slide, can work as a lock-in only, or lock-in and lock-out drawer slide depending on the orientation of the slides. All you need to do is swap the left and right sides and the locking mechanism will operate in the other mode. This 48" model has a dynamic weight capacity of 396 lbs. or 180 kg.. The Fulterer FR5400.L, 50" Heavy Duty Locking Drawer Slide, can work as a lock-in only, or lock-in and lock-out drawer slide depending on the orientation of the slides. All you need to do is swap the left and right sides and the locking mechanism will operate in the other mode. This 34" model has a static weight capacity of 396 lbs. or 180 kg.. The Fulterer FR5400.L, 52" Heavy Duty Locking Drawer Slide, can work as a lock-in only, or lock-in and lock-out drawer slide depending on the orientation of the slides. All you need to do is swap the left and right sides and the locking mechanism will operate in the other mode. This 52" model has a static weight capacity of 374 lbs. or 170 kg.. The Fulterer FR5400.L, 54" Heavy Duty Locking Drawer Slide, can work as a lock-in only, or lock-in and lock-out drawer slide depending on the orientation of the slides. All you need to do is swap the left and right sides and the locking mechanism will operate in the other mode. This 54" model has a static weight capacity of 374 lbs. or 170 kg.. The Fulterer FR5400.L, 56" Heavy Duty Locking Drawer Slide, can work as a lock-in only, or lock-in and lock-out drawer slide depending on the orientation of the slides. All you need to do is swap the left and right sides and the locking mechanism will operate in the other mode. This 56" model has a static weight capacity of 374 lbs. or 170 kg..